The Regional Business Class product of Singapore Airlines is one that is often talked about - the 1-2-1 cabin configuration offers direct aisle-access for every single seat and the lie-flat seats are definitely comfortable enough for a medium-haul flight. Even though I have experienced this previously on the delivery flight from Charleston to Singapore, I have not actually flown it for leisure. On my latest trip to Bali, I decided to book flight SQ942 which is operated by the Boeing 787-10 Dreamliner. Click HERE to compare flight and hotel prices! After having a light breakfast and a glass of Champagne in the SilverKris Lounge, I made my way down to the boarding gate. As you would expect, Business Class passengers were amongst the first to board the aircraft (since there is no First Class on Singapore Airlines' 787-10 Dreamliner) and I quickly settled down in Seat 15K which is a window seat that is relatively more private (since there is a console between the seat and the aisle). There are 36 Business Class (and 301 Economy Class) seats on this aircraft and they have an impressive 60" of seat pitch (as compared to 32" in Economy) and 30" of seat width (as compared to 19" in Economy). While the Business Class does look quite compact, the actual space that you get is quite decent. I also like that it is very private since you cannot really see what the passenger next to you is doing or watching unless you make a deliberate attempt to find out (but don't do that because it's creepy). Even though the Business Class seats on Singapore Airlines' Regional Business Class offers only 30" of seat width, it does feel quite roomy once the arm rest is down. Besides, for a 2-hour flight between Singapore and Denpasar, you do not really need that ridiculous amount of space that you can find on the old [Singapore Airlines Business Class seats]. If this is your first time in Business Class on the 787-10, you will definitely realise that the usual seat belt has been replaced with one that vaguely resembles a car seat belt instead. I remember that these seat belts were previously a 3-point one (meaning you will first have to put on the lap belt before attaching the shoulder belt) but now it seems like you can do it all at once. Browsing through KrisWorld (Singapore Airlines' in-flight entertainment system) is always a fun activity since they are typically quite fast at getting the latest movies into the system but somehow, I always end up re-watching episodes of Brooklyn Nine-Nine that I have seen a number of times. Since this is a short-haul flight, slippers and socks are not provided so feel free to bring your own if that is something that you require. If you are flying back to Singapore, just grab an additional pair of disposable bathroom slippers from your hotel to make sure that you are all comfortable for the flight. Noise-cancelling headphones are provided for all Business Class passengers and even though they are most-likely OEM products, they do sound rather decent and they are quite comfortable. I always travel with my own headphones so I do not have to bother with these. If you thinking about picking one up for your flight, I highly recommend checking out iShopChangi if you are buying a branded one. Juices and water were offered on the ground prior to taxiing but the good stuff (i.e. Champagne) was only served after take-off when the seat belt sign has been turned off. As I have mentioned before, if you are in right window seats, the cocoon-like design of the seats offer a lot of privacy. Even though I was leaning forward, I could barely see the face of the passenger who was seated in Seat 15F. There is a side stowage compartment located on top of the console and this is also where you will find a universal power socket as well as two USB charging ports. This area can be used to store small items like your wallet, passport and mobile phone but it will not fit a decent-sized laptop. The sliding door has to be closed prior to take-off so do the cabin crew a favour and keep them closed while they are making their way through the cabin for final checks. If you need to make sure that you are looking good without wanting to make your way into the lavatory, there is a sliding vanity mirror that is tucked away between your seat and the stowage compartment. I really like the controls on the side of the console since it provides 'haptic feedback' (similar to what you would get on the latest iPhones and Apple Watch) when you push the button. The touch-sensitive 'buttons' also light up when you push them and they remain lit (dimmed) for ten seconds before going off completely. 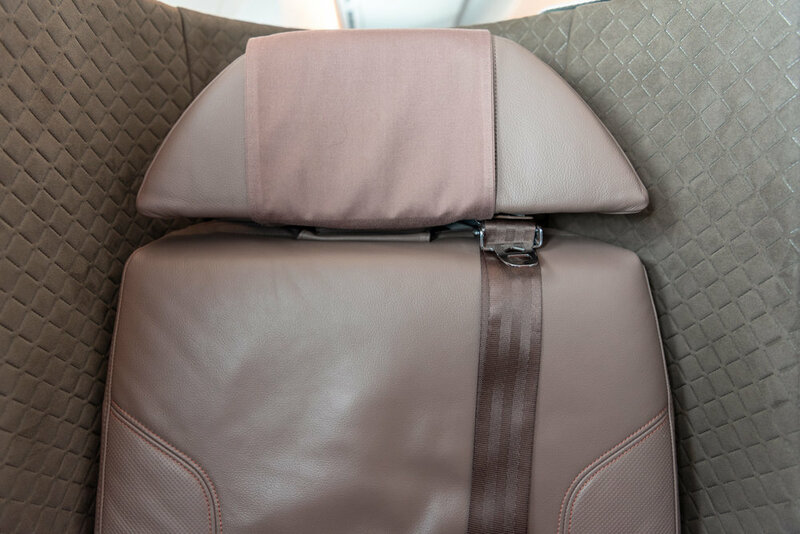 If you wish to recline your seat into a flat-bed, simply push and hold the (that's the one to the left of the 'Do Not Disturb') button until the seat is in the position you desire. Meal service started shortly after the seat belt sign was turned off and as you would imagine, lunch was served as a single tray instead of multiple courses that you would typically get on long-haul flights. The tray table can be released from under the screen and it comes out in a half-folded position which is great for those times where you do not need the entire table (e.g. when you are nursing a glass of Champagne while snacking on some nuts). About a year ago, Singapore Airlines started making the in-flight menu available online (prior to the flight) so you know what to expect. This is especially great if you are flying in Premium Economy, Business or First Class since it will probably guide your decision towards whether or not you would like to Book the Cook. For this flight, I have actually ordered the Nonya Nasi Padang which was served with beef rendang, opor ayam (chicken in a turmeric coconut gravy), sayur lodeh and steamed rice - absolutely delicious and I would definitely be ordering this again on an upcoming flight! Meal service was slightly slow on this flight unfortunately and while waiting for the bread basket to come around, I decided to focus on my glass of Champagne instead. As usual, Singapore Airlines pours Charles Heidsieck Brut Reserve Champagne on Business Class so nothing much to get excited over but thankfully it's still extremely drinkable. After about 5-7 minutes of waiting, I decided to dig in to my meal since it was getting cold - I had initially wanted to take a 'complete' photo with the croissant. Shortly after that, a cabin crew came around with the bread basket but I noticed that he has missed a number of rows. This is definitely an anomaly since the sequencing and timing of meal services are perfect on Singapore Airlines flights. Anyone who has taken a Dreamliner before would know how to operate the window ‘shades’ - the technology is actually quite interesting and I highly recommend anyone who is remotely interested to read up on it. I made the window a little darker since I was ready to resume watching some shows after a satisfying meal. 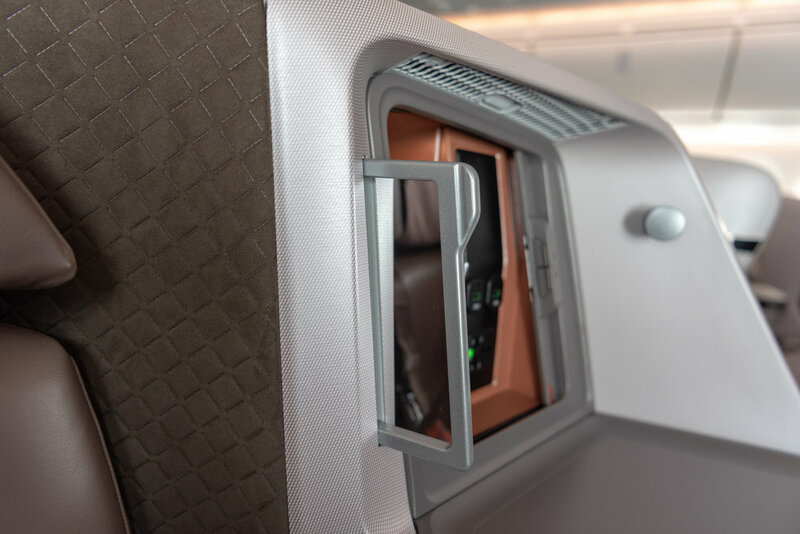 While it is easy enough to navigate the inflight entertainment system using the touchscreen, you may also use the IFE handset if you prefer more tangible buttons. If you enjoy watching the flight path and tracking your flight (hey, some of us actually do! ), you will be able to navigate through the whole screen using the handset. If you are traveling alone and you would like the most privacy for your flight from Singapore to Bali, I cannot recommend the Business Class product on Singapore Airlines enough - just make sure that you are booked on a 787-10 instead of a A330 since it makes a world of difference. However, if you are traveling with a friend or a loved one, I highly recommend for you to check out the Business Class product on KLM since the price is at least half of what Singapore Airlines charges. If you are thinking about redeeming your miles, a one-way trip on Business Class will only set you back 17,500 KrisFlyer Miles and less than S$50 in taxes.